The leaves are changing, the air is colder and pumpkin spice lattes are trending again– fall is officially here. However, the season can’t be fully rung in without the University of Wisconsin–Stout’s Oktoberfest Buffet. 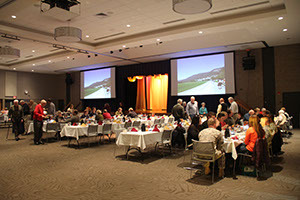 Oktoberfest Buffet, which started during the Memorial Student Center’s first year in 1985, celebrates the strong presence of German heritage within Wisconsin by serving German-inspired cuisine. This year’s menu boasts a wide variety of traditional German foods such as slow-roasted pork with sauerkraut, sauerbraten meatballs, sweet & sour cabbage salad and apple strudel. Staffers also attempt to create an appropriate atmosphere by presenting a slideshow with pictures from Germany and displaying fall and German-related decor. However, Oktoberfest has more to it than just celebrating German culture. Oktoberfest is just one of the many events that University Catering Services covers each year. Their customers range from local businesses to the general public with over half of a million dollars in catering each year. But going beyond a celebration of heritage and a chance to market catering services, the campus Oktoberfest is simply an event promoting camaraderie among Stout students and faculty. The event takes place on Wednesday, Oct. 22 from 11 a.m. to 1 p.m. within the Great Hall of the MSC Tickets can be ordered online for $9 prior to the event and $10 the day of. Get your ticket now and celebrate Wisconsin’s German background with food and friends on Oct. 22!